Established in 1993, Norwegian Air Shuttle was formed to take over the operations of Busy Bee, who had been offering flights from Norway since 1966. Norwegian Air Shuttle flew 50 daily routes in 1995. In 2002 the company was re-branded as Norwegian, offering domestic flights as a low-cost carrier. In 2012 Norwegian increased the fleet of aircraft and moved the operations base to London Gatwick. The following year the airline announced new destinations to Spain, Portugal, Italy and Croatia, in direct competition with Easyjet and RyanAir. Norwegian is the third largest budget carrier in Europe and rank ninth in the world, with a passenger total of over 30 million in 2016. 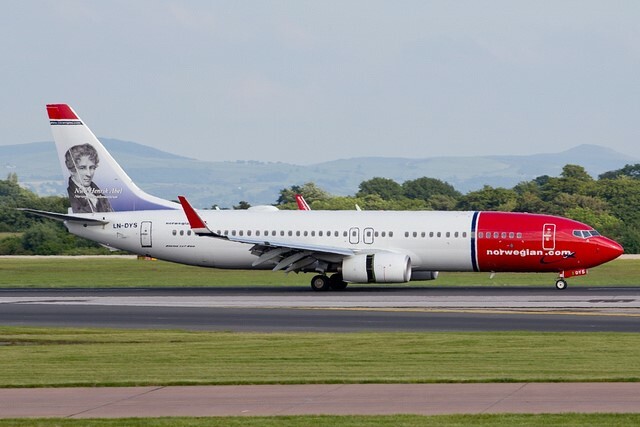 The distinctive livery, featuring the red nose on the aircraft and portraits of famous Scandinavians on the tail, make Norwegian easily recognisable. Norwegian Air has confirmed the transfer of operations from San Javier airport to Corvera airport next year when San Javier airport closes. Flights are scheduled in and out of Corvera airport from 3rd April 2019 and increasing in June 2019 for the summer months. From 3rd April there will be two weekly flights from Oslo (OSL Gardamoen), Bergen (BGO), Stavanger (SVG) and Trondheim (TRD) into Corvera. Flights will leave Oslo or Stavanger on a Wednesday and Saturday each week. Wednesday and Saturday flights from Bergen into Oslo with the connecting flight scheduled to land at Corvera. Wednesday and Saturday flights from Stavanger into Oslo with the connecting flight scheduled to land at Corvera. Wednesday and Saturday flights from Trondheim into Oslo with the connecting flight scheduled to land at Corvera. From 18th June and through July and August, there will be an additional flight per day from Oslo, Bergen and Stavanger. In September flights will revert to twice weekly (Wed, Sat). In order to check in for your flight at Corvera Airport, go to the terminal where your flight departs from, or follow the instructions provided on your ticket.